I am delighted to witness that established in the year 2013, Tantia University has marched at a sure and steady pace, developing a sprawling campus, rich infrastructure and strengthening the committed staff force in a short span of time. It is true that the tertiary education, imparted by universities, colleges and institutes of higher studies, plays a pivotal role in creating and disseminating knowledge, fostering a right set of skills and competencies, developing healthy attitude, and inculcating a value system among the youth. Tantia University- the first and pioneering university in the North Rajasthan, is all committed to achieve these goals and meet the future challenges. Taking over the charge of the office of President (Vice Chancellor) in October 2016, I reviewed and educated myself about the functioning of the University. I have set certain realistic goals to be achieved in a phased manner and have shared the same with the faculty. My main thrust is towards augmenting and mobilizing resources, including the human resource, for raising the academic standards and accelerating development of the University in different fields. It is worth mentioning that the management of the university endorses the idea and is highly supportive for the cause of excellence. I realize that the students may face a plethora of problems in seeking employment and admission for pursuing further studies elsewhere for the want of Degrees. Therefore the University is taking concrete steps to get the degrees printed and dispersed to the qualifying students in a convocation ceremony. Creating a right research environment is yet another priority. I am happy to note that the University is seriously executing its research program as per the provisions of the University Grants Commission to the effect. On curricular aspect I would request the respective Boards of Studies to update their syllabi in the light of present and future needs. Placements of the passing out students have been encouraging and more efforts will be made on this front. Special arrangements are also being focused upon for co-curricular and extra-curricular activities including the sports events. In order to stimulate the academic environment and to keep the faculty and students abreast with the advances in various spheres of knowledge, the University envisages organizing some national and international conferences and seminars in near future. A few have already been organized in recent past. Associating other leading educational institutions from the region will surely help developing an academic environment, the people of the area looking for. I welcome the students to this pious campus of learning so that we can chisel them as good professionals and citizens. Prof. M.M. Saxena is M.Sc. Zoology with specialization in Environmental Biology-Gold medalist, and Ph.D. from University of Jodhpur. 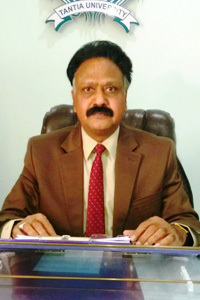 He has served Maharaja Ganga Singh University, Bikaner in various capacities including Dean - Faculty of Science, Professor & Head, Department of Environmental Science, Director Research, Controller of Examinations, Chairman Central Library, Coordinator UGC NET, and Coordinator Self Finance Courses besides being the Member of the Board of Management of the University. He has over 36 years of Research, Post-graduate teaching, and Administrative experience while working with Maharaja Ganga Singh University, Bikaner, University of Jodhpur, College Education- Rajasthan, and Zoological Survey of India. Prof. Saxena has been the Research Supervisor of MGS University, Bikaner, M.D.S. University, Ajmer, M.L. Sukhadiya University, Udaipur, IGNOU, New Delhi, and in this capacity he has supervised 21 Ph.D. and 26 M.Phil. scholars. He has to his credit over 150 Research Papers published in the journals of international repute, besides authoring 6 Books. Some of his books have been included as the Reference Books in the curricula of various universities. His major areas of research include Hydrobiology of the Indian desert with particular reference to freshwater sponges, leeches, molluscs, periphyton, bioindicators, trophic state indices, pollution ecology and aquaculture in addition to some minor areas like Microbiology, Entomology, Wildlife and Parasitology. He has been the Editor of OIKOASSAY- an international journal of environmental and allied sciences since 1984. He is also on the Advisory Board of many scientific journals. Prof. Saxena has represented over 85 national and international seminars/conferences, many in the capacity of the Chairman and Invited Speaker. He holds the credit of organizing two International Conferences. Twice he has been invited to deliver Invited Lectures at the prestigious Indian Science Congress. He has undertaken 4 Research Projects funded by different agencies. Prof. Saxena is the member of different academic bodies of the various universities in the country. He has been a Resource Person and examiner for different Universities in Environmental science, Zoology, Fisheries and allied disciplines and has also been awarded by a number of agencies for contribution to the field of education and environment.